Wonder Boy is one of those old series that nostalgically draws me in. The first game in the series, as you should all know, features an islander on a skateboard throwing hammers at snails. It was awesome. Then something happened. The whole series fractured and splintered. The main series continued as Wonderboy but became an action RPG, while the platforming elemenst served as the basis for Adventure Island. It fractured even more, with the Wonderboy getting a Monster World sub-series. We’re getting a new one of those. Indie developer Game Atelier was working on what was a spiritual successor to the SEGA-bound RPG series. It had a silly name, which is possibly why it failed at its kickstarter bid. For some reason, nobody really wanted to play something called Flying Hamster II. 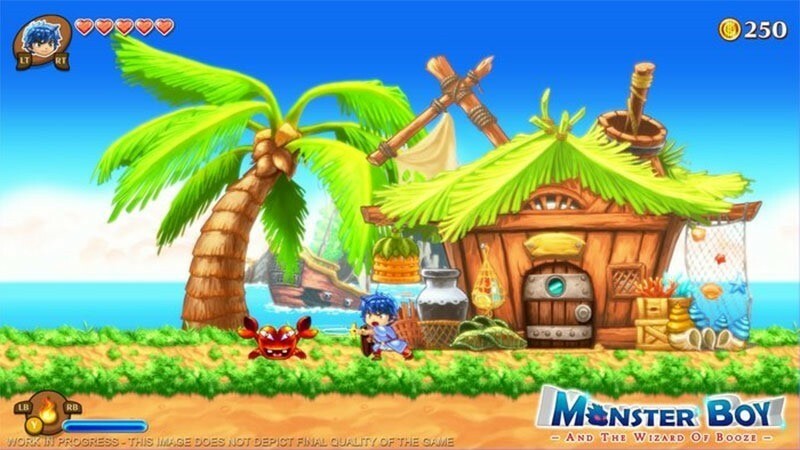 That game is now being retooled as an actual Wonderboy game; Monster Boy and the Wizard of Booze. It’s being developed with the help of the original Montser Land creator Ryuichi Nishizawa – so it’s an official game in everything but name, as SEGA still owns the trademark. It’s been changed a little, so there are “no more hamsters but a new hero with a story matching with the Monster World universe”. As it’s now got a publisher, the kickstarter funding has been axed. It’ll be out on PC and PlayStation 4 later this year. It looks fun and whimsical, and just the sort of thing I feel like playing right now. Here’s the banjo-filled announcement. As SEGA had a much larger presence here than Nintendo did in the 16 bit era – did you play any of the Wonder Boy/Monster World games – or were you more of an Adventure Island sort? Previous article The Witcher 3 is how big on consoles? Next article There's no justice in these first pics and trailer for GAME OF THRONES season five!